Soho Ventpac – the natural heating and ventilation system. Keep your house fresh, warm, and healthy with automatic window openers and recirculated warm air. The best thing about our new building is the sustainable design features, especially the automatic windows, that came as a bonus – Sheryl Mateni, Managing Director Strait Shipping, 2003. Passengers waiting for the Bluebridge ferry at Wellington's Glasgow Wharf benefit from an early Solarhomes installation in this waterfront building. 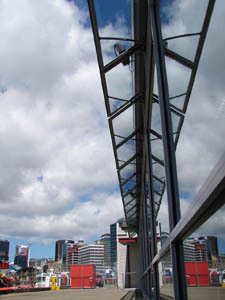 Fresh air on the waterfront means thermostatically controlled natural ventilation is highly efficient at eliminating the need for air conditioning. Solarhomes sensors open the windows when carbon dioxide levels exceed 900ppn and close the windows whenever supplementary radiant heaters are on. The system has run successfully for 6 years and saves a considerable amount in cooling energy.